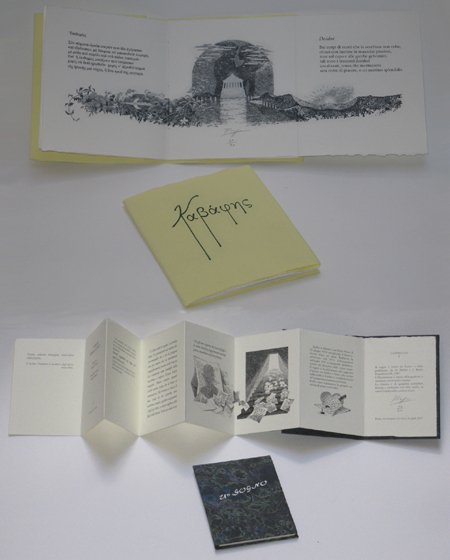 We have begun in 1994 and we publish few titles annually in limited edition numbered and signed. We are primarily interested to poetries and brief stories, also in original language and in translation, of ancient and contemporary authors, illustrated with original engravings, in chalcography and xylography, by contemporary artists. We use the papers produced by “Cartiera di Sicilia”. The our small “plaquettes” derive from the hold collaboration with the writers and the artists, the realization is coordinated by Vincenzo Piazza that he is painter, etcher and printer and, thanks to his competences, he also takes care of the decoration of the papers (marbled and paste paper) and the bindings.